It turns out August 15, 2012 would have been Julia Child’s 100th birthday. To celebrate, we’re having another Julia book giveaway but first we’d like to announce the winner of last week’s Julia’s Cats: Julia Child’s Life in the Company of Cats giveaway winner is Janice R. Congratulations! Look for an email from Layla Morgan Wilde. When a publicist from Abrams Books sent me a review copy of Minette’s Feast: The Delicious Story of Julia Child and her Cat it felt like a feast for all the senses. My assistant Merlin agreed. The gorgeous book by Susanna Reich and illustrated by Amy Bates is suitable for readers from ages 3 to 100. It chronicles the pivotal time in Julia Child’s life when she discovered her passion for both cooking and for cats. Minette was Julia’s first cat or as she liked to call them “poussiquettes” in France, and this story captures in beguiling detail their charmed and charming relationship. The quality of the hard cover book, like everything from Abrams Books is top notch. With very young kids, I prefer removing the flap jacket and was pleasantly surprised to find more scrumptious illustrations. When I found out the author lived near me in Westchester County, I contacted her. Susanna and I had a lovely chat on the phone and she generously consented to a last minute Q & A.
LMW: You’ve written several biographies; what inspired you to write an illustrated book about Julia Child and her first cat Minette? SR: I’ve always been a Julia Child fan. Then I found out she was a cat lover who got her first cat when she lived in Paris. Lucky Minette ate Julia’s leftovers and played with a Brussels sprout tied to a string. In return she’d leave mice on the living room rug. Who could resist such a great story? LMW: Julia Child did not become a cat person until she moved to Paris. 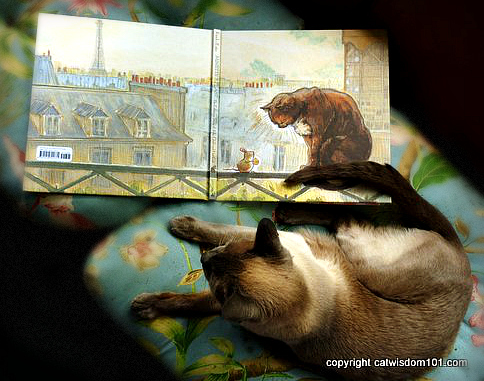 Why do you think cats became so important to Julia, and do you think French cats any different? SR: Julia was a born nurturer–just look at the way she loved to feed people. She and her husband didn’t have any children, and Minette became part of the family. As for French cats, they’re just like cats everywhere. Except they speak French! LMW: What message would you like readers of Minette’s Feast to take away? SR: Julia was more than a famous TV chef and cookbook author–she had a happy marriage and a loving, playful relationship with her cat. I hope readers will laugh at the humor and enjoy the book as a beautiful little snapshot of her life in Paris–romantic, picturesque, and food- and cat-centered. LMW: You had the honor of designing special floral arrangements for Julia Child’s 80th birthday party. Celebrities often have different public and private personas. What Julia was like in person? SR: She was exactly the way she was on TV–funny, relaxed, down-to-earth, and a bit of a ham. LMW: Many writers have feline “assistants”. Can you tell our readers a little about yours? SR: My cat, Chloe, sits on my desk while I work. She thinks Minette’s Feast is her book and claims it says so, right on the dedication page. She’s right, of course. 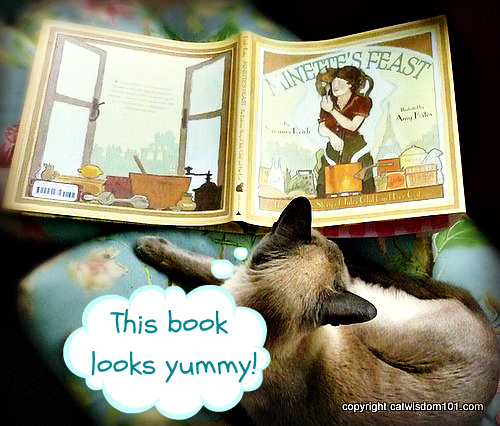 LMW: When is you next book signing of Minette’s Feast? SR: August 18 at Books of Wonder in New York City; September 15 at Washington Irving’s Sunnyside in Tarrytown, NY; September 23 at the Brooklyn Book Festival; and September 29 at the Baltimore Book Festival. LMW: What book project are you currently working on? SR: A picture book about the young Beatles. The working title is Fab Four Friends: The Boys Who Became the Beatles. Enter to win a copy of Minette’s Feast by simply leaving a comment at this post anytime until 11:59 PM EST August, 11, 2012. The winner will be announced next Sunday. Good Luck Poussiquettes! Merlin gives Minette’s Feast his highest rating of four paws. Hey there, You have done an excellent job. I will definitely digg it and personally recommend to my friends. I am sure they will be benefited from this site. When I initially commented I clicked the “Notify me when new comments are added” checkbox and now each time a comment is added I get three e-mails with the same comment. Is there any way you can remove people from that service? Thanks! You made some nice points there. I did a search on the subject and found most individuals will approve with your blog. [link=http://www.smallbusinesswebdesign.co.uk]small business website design edmonton[/link] small business web design michigan lntrxjpnrf, 5167 [link=http://cheapjordanshoesales.webs.com/]cheap jordans[/link] v9hrybc7et, 6643 [link=http://bestfacebookhack.com/]facebook hack mobile[/link] facebook hack no survey. 5507 [url=http://usepheromones.webs.com/]pheromones kuwait[/url] pheromonoes [url=http://buypheromones.webs.com/]pheromonoes[/url] 9425 [url=http://pheromone101.webs.com/]pheromones for men review[/url]. I would love a copy of this. 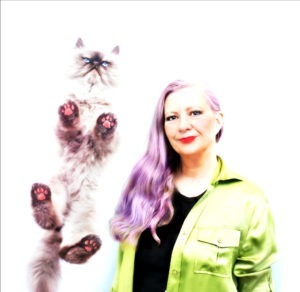 I’m a big fan of Julia and of course Kitties! Oh thank you for letting us know about her book signings! As an avid book collector and a fan of felines, I am very excited about this beautiful little book. Wishing you continued success! This looks even more interesting than the other Julia Child book! This looks like an enchanting book. 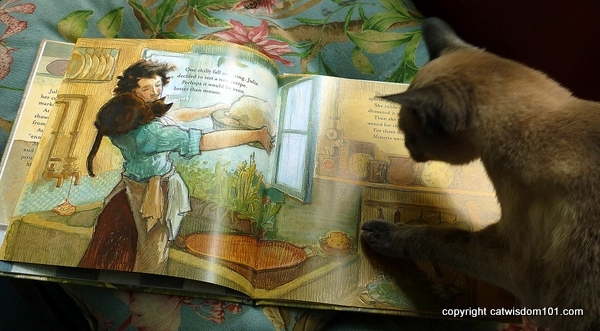 julia Child and her cat in a book! I AM enamoured! I would love to win this! What a charming book. Reading and kitties and books galore! What could better? Nothing more. Thanks for the chance to win a beautifully illustrated book. It looks wonderful, and I never ignore a 4 paws rating! I would love to have one to read and share. Another great book about my favorite chief. The girls and I would love it. Love this book. I read it at a friends and would love a copy! her spending much of her time on the kitchen counter, or sink, overseeing the cat feeders to ensure everyone was getting their equal share, I gave her a last name too. She is now affectionately known as Ms Julia Childs! I promise to take a photo of her with the book, and send to the publicist! I I I I admired Julia child and would love to win this book. This looks like a lovely book. I would sooooo love to read this book! Being a major foodie, cookbook collector and cat freak this is right up my alley!!! I adored Julia and would cherish this! Also loved your interview and am looking forward to the next book about the young Beatles, another of my obsessions! When I was young, I had a very strict step-father and the only television show he let us watch was the French Chef! I loved Julia then and love it even more that she had such affection for cats! Please enter me for a chance to win this beautiful book! If I don’t win this one, I’ll have to go and buy them both! Julia Child, cats, food, illustrations, books, what could be better?! That book sounds quite yummy! I love this book, and it’s the perfect companion to the new book about Julia Childs and her cats, which I think you reviewed last week. This looks like another beautiful cat book. Julia Child and cats just go together. I want a chance to win!! God, what a fabulous, fabulous book. Julia Child lived not far from me. Not that I ever saw her. But next town over. We had cooks at home and had pretty much what she made. This book looks absolutely fantastic. Ooooh. I love this book.